The Legislative Corps Weekly Report is an electronic round-up delivered by e-mail of the week's legislative and regulatory actions sent to AASA Legislative Corps members. Leslie Finnan, editor. 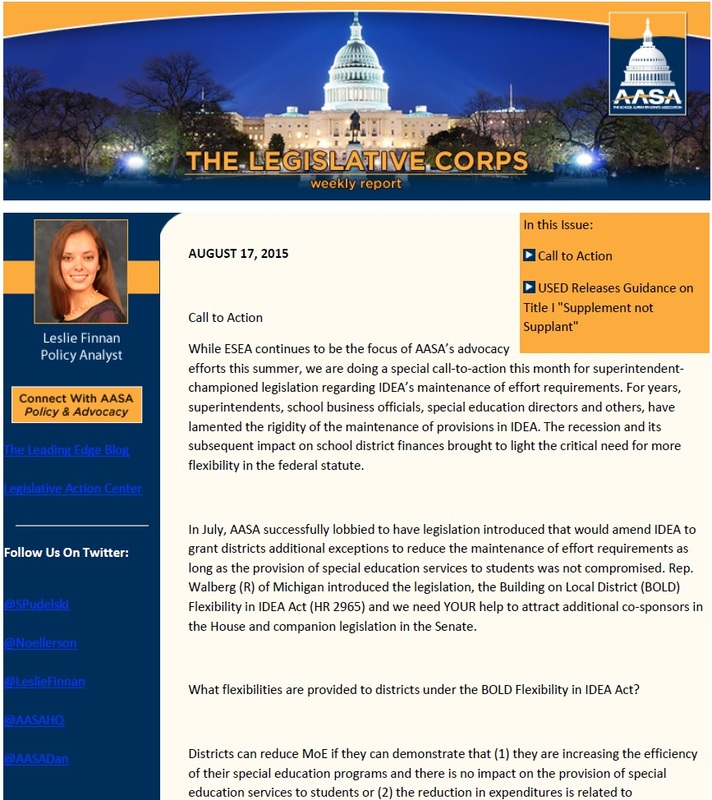 If you are an AASA member and you would like to receive the full text of the AASA Legislative Corps Weekly Report, e-mail Leslie Finnan at lfinnan@aasa.org. Not a member? Join now! Have you ever found yourself talking back to the television screen? Muttering to the editorial page of your newspaper? Yelling at a member of Congress on talk radio? These folks just don't get it, you may be saying. Who's advising them? Often it's just their own memories of what school was like for them. Want to change that? Join the AASA Legislative Corps! Read a brief AASA Legislative Corps overview (PDF). Our work supports superintendents and school system leaders at every career level, from those aspiring to go into administration to those whose work has made them champions for our public schools and children.